7075 Bare Aluminum Sheet/Plate is an aluminum alloy, with zinc as the primary alloying element. It is strong, with a strength comparable to many steels, and has good fatigue strength and average machinability. It has lower resistance to corrosion than many other Al alloys, but has significantly better corrosion resistance than the 2000 alloys. Its relatively high cost limits its use to applications where cheaper alloys are not suitable. 7075 Bare Aluminum Sheet/Plate s composition roughly includes 5.6–6.1% zinc, 2.1–2.5% magnesium, 1.2–1.6% copper, and less than a half percent of silicon, iron, manganese, titanium, chromium, and other metals. It is produced in many tempers, some of which are 7075-0, 7075-T6, 7075-T651. 7075-T6 Bare Aluminum Sheet/Plate is primarily used in aerospace industry, often referred to as the Strongest Aluminum grade. Unlike the Clad, the Bare Sheet isn’t coated with an additional aluminum layer. Alloy 7075 Aluminum Sheet/Plate has the strength of many steels, while retaining aluminum’s lightweight qualities. Alloy 7075 Aluminum Sheet/Plate has been the standard workhorse 7XXX series alloy within the aerospace industry. 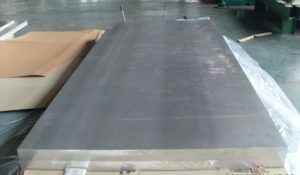 Zinc is the primary alloying element in 7075 Aluminum Sheet/Plate and was the first successful Al-Zn-Mg-Cu high strength alloy using the beneficial effects of the alloying addition of chromium to develop good stress-corrosion cracking resistance in sheet products. 7075 Aluminum has a lower level of corrosion resistance and has no weldability, i.e. it is not weldable. This particular kind of alloy is known for its level of fatigue strength, however, it is only average when it comes to machinability. 7075 Aluminum Sheet/Plate is one of the highest strength aluminum alloys made for the industrial and consumer markets. Although other 7XXX alloys have since been developed, Alloy 7075 remains the baseline with a good balance of properties required for aerospace applications. In terms of application, it is perfect for parts that have areas that are highly stressed. These specific strength properties are ideal for the construction of military grade rifles, plastic industry molds, bicycle part and equipment as well as aircraft structures. 7075 T651 Aluminum Sheet/Plate is also available and is best suited for aviation and aerospace applications. Ultimately, if strength is what you need, this particular tempered alloy also has higher tensile strength.